Wow! With your overwhelming generosity we have been allowed to extend our goal to $7500. This money will provide the team with the opportunity to attend multiple competitions and other events. Thanks again for your support! Each year the UNC Charlotte Formula SAE Team designs, manufactures, fabricates, tests, and competes in a Formula Style race car. 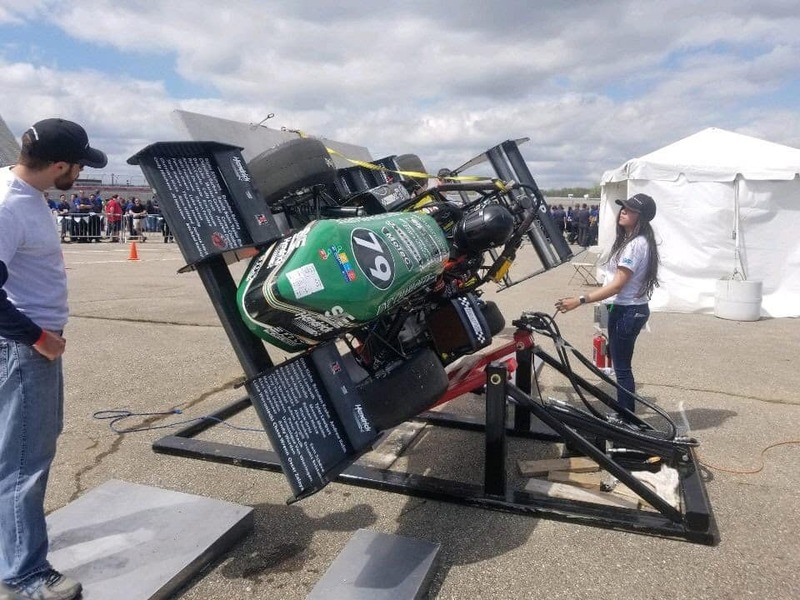 A team of engineering and like-minded students collaborate to build the FSAE car from scratch and develop the performance of the vehicle to be competitive at 2 biannual worldwide SAE sanctioned competitions, FSAE Lincoln, and FSAE Michigan. We also compete in a number of regional FSAE and autocross events to keep our skills sharp and develop the performance of the race car. In 1981, SAE International (formerly known as Society of Automotive Engineers) developed and managed the first Formula SAE® (FSAE®) student competition with assistance of Ron Matthews, Professor at University of Texas. SAE International operated the only Formula SAE competition for 17 years before its partnership with IMeche (Institution of Mechanical Engineers) in England where the brand “Formula Student” was developed. Since its inception, Formula SAE has expanded and includes many spin off events. In the United States there are two competitions managed by SAE International. Internationally, the expansion of Formula SAE/Formula Student has exploded to over 20 competitions currently hosted by engineering societies or private business. ​The concept behind Formula SAE is that a fictional manufacturing company has contracted a design team to develop a small Formula-style racecar. The prototype racecar is to be evaluated for its potential as a production item. The target marketing group for the racecar is the non-professional weekend autocross racer. Each student team designs, builds and tests a prototype based on a series of rules whose purpose is both to ensure onsite event operations and promote clever problem solving. The vehicle will be inspected in a series of tests to ensure it complies with the competition rules; in addition, the vehicle with driver will be judged in many performance tests on track. The rest of the judging is completed by experts from motorsports, automotive, aerospace and supplier industries on student design, cost and sales presentations. Formula SAE promotes careers and excellence in engineering as it encompasses all aspects of the automotive industry including research, design, manufacturing, testing, developing, marketing, management and finances. 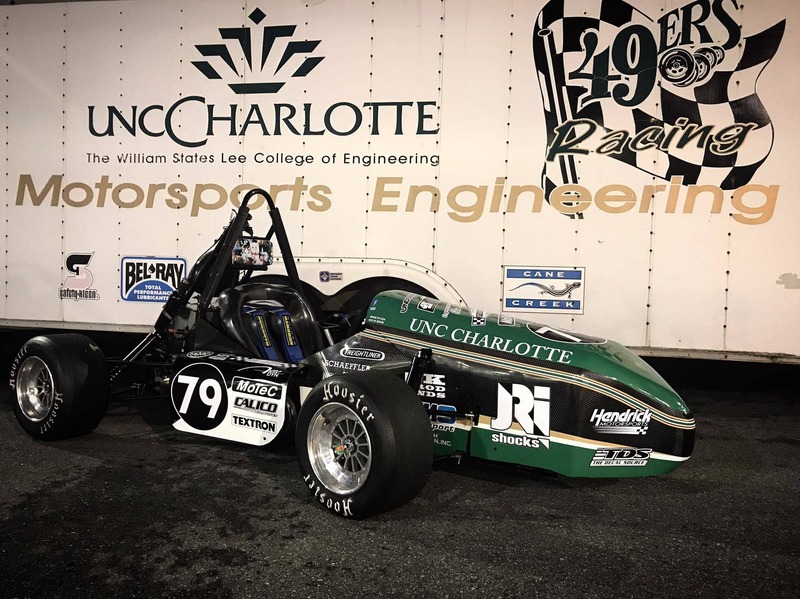 Your support will help our team achieve our goals with the purchase new tires, fuel, and other consumables for the 2019-20 UNC Charlotte Formula SAE Competition Car. Average cost of per fastener is $0.62. There are more than 900 fasteners on the FSAE car. Your donation can help cover the cost of nuts and bolts! Now we're moving! So your donation can help us stop! Brake pads and rotors are wear items. Each test consumes a set of brake pads which are custom made for the FSAE car. This is where the rubber meets the road. We take every opportunity to reach out to the local community and give back for the blessing we have received. Your donation can help cover the cost of transporting the car to these events. Fueling the future of engineering! Each competition season the team consumes up to 200 gallons of high octane racing fuel. Your donation will cover the cost of fuel consumed during one testing session. We can see the winner's circle from here! Each competition season the team can wear through as many as 40 tires, each tire is custom made for FSAE vehicles. Your donation can help cover the cost of a single tire.